LA Duct Cleaning Commercial air duct cleaning professionals are certified, qualified and trained in HVAC systems cleaning, restoration and maintenance. there no commercial or Industrial building the we can’t handle, we have service severals properties throughout Los Angeles and Orange County. We will work with you to develop a commercial duct cleaning, serving Office, School, Restaurant Hospital, or factory’s needs. One of our commercial and industrial duct cleaning specialist will be send to the worksite. There, we will examine the system to determine the commercial or industrial property’s needs, Working with you to develop a plan that will accommodate each area of interest. We will also provide a detailed checklist of the National Air Duct Cleaners Association Standards, which reviews and guarantees holistic Commercial or industrial Ventilation duct cleaning. After we’ve addressed all concerns, our ASCS Certified commercial property specialist will work with you to establish an affordable quote and reasonable time to provide the service. Each quote clearly details the estimate completion time, labor requirement and price, so there will be no surprises on-site. After the service is performed, our office will follow-up to ensure that you are satisfied with your service. 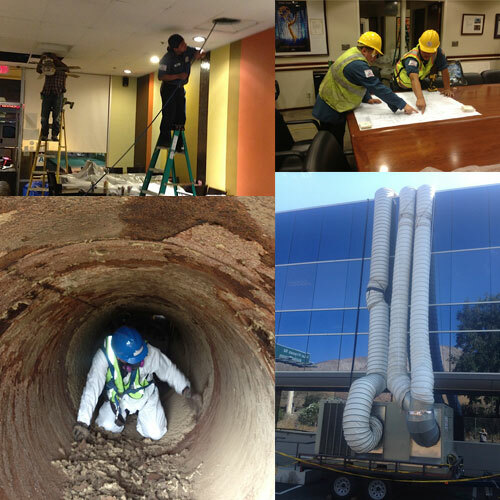 Commercial Duct Cleaning, professional technicians receive continuous and rigorous training to service both commercial and industrial property sites. We are licensed, and bonded and insured so you can count on certified, qualified and trained air duct cleaning professional to provide commercial ventilation and industrial ventilation cleaning to your business.